Welcome to the very first Special Episode of Remakers Mark! The whole geek community, including all of us here at Remakers Mark, were flabbergasted by the Disney purchase of Lucasfilm, and announcement that a ‘Sequel Trilogy‘ of Episodes VII, VIII, and IX would be made. 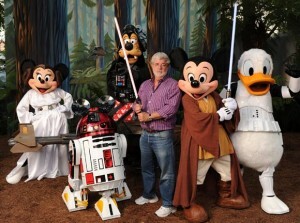 A few months later, it was also announced that Disney would be making stand-alone Star Wars features. And that’s where this Special Episode comes into play: here we each provide an example of what we would like to see in a stand-alone Star Wars film. From Knights of the Old Republic to a deep dive into the world of the Sith, we leave few Star Wars Universe stones unturned. Kyle: If Han, Leia, and Luke are involved in VII and beyond, there’s no way they’d use anyone but the originals. I think they’d likely write it differently so that the characters would only be referenced if they weren’t involved. Luke is head of the Jedi council. Leia is a full Jedi knight having been trained by Luke. Both have fully-trained Jedi knights beneath them. One is played by Summer Glau, the other by Armie Hammer. Han is a 4-star general and “Chief of Staff” of the new Republic Military. Chewie still looks the same. Luke is the head of the chess club. Han has become the galaxy’s best lightsaber butcher. Summer Glau is the Force. Leia and Chewie have a love child. It is literally a walking carpet. I like the walking carpet idea. Karma for Leia. Han lost the Falcon back to Lando in a Sabaac match and has become the leader of Cloud City. His love/hate relationship with Lobot is hilarious. Chewie now has a life debt owed to Mon Mothma’s son, Mads Mikkelsson, a swashbuckling, force weilding, one eyed pilot from the outer rims. Andy: And Meryl Streep is the Force. Lee: I think Summer Glau can play a better force than even the great Meryl Streep. Jer: Also, Steve Zahn plays Jek Porkins II, a wily wise-cracking T-16 pilot being hunted by the remnants of the Empire. Lee: Steve Zahn is Porkins III, fat Val Kilmer is Porkins Jr.
Jer: Now THAT is a Star Wars spinoff movie I’d watch.